Arno Stubenrauch, SKF manager development cluster roller and plain bearings, Schweinfurt, Germany. Ambitious worldwide renewable energy targets are pushing wind energy to become a mainstream power source. For example, the Global Wind Energy Council, GWEC1, expects that the currently installed wind energy capacity of 200 GW will double within three to four years, keeping open the aspir­ational goal of 1,000 GW of installed capacity by 2020. Despite high wind turbine availability (> 96 %, depending on turbine), and a relatively low failure rate of mechanical components compared with electrical components, failures on mechanical drive trains still create high repair costs and revenue loss due to long downtimes2. In most wind turbine concepts, a gearbox is commonly used to step up the rotor speed to the generator speed. Today, the actual service life of wind turbine gearboxes is often less than the designed 20 years. Failures can be found at several bearing locations, namely the planet bearings, intermediate shaft and high-speed shaft bearings (fig. 1). 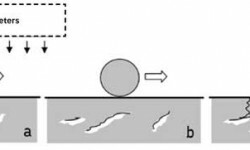 Much premature wind gearbox bearing damage results in a failure mode that is not caused by the classic rolling contact fatigue (RCF) mechanisms (fig. 2). While these classic mechanisms are sub-surface initiated fatigue as well as surface initiated fatigue and can be predicted by standard bearing-life calculation methods (refer to ISO 281 and ISO/TR 1281-2), premature crack failures are not covered by these methods. However, attempts to calculate bearing life have been made when detailed information of the case is available (e.g., local effect of hoop stresses)37. 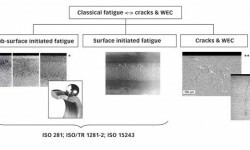 ISO 15243 describes the visual appearance of the classic rolling contact fatigue mechanisms. White etching refers to the appearance of the altered steel microstructure when polishing and etching a microsection. 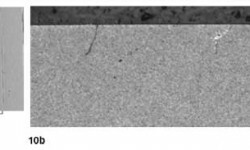 The affected areas, consisting of ultra fine nano-recrystallized carbide-free ferrite, appear white in a light optical micrograph due to the low etching response of the material. Known to occur only occasionally in some industrial applications such as paper mills, continuous variable drives, marine propulsion systems, crusher mill gearboxes or lifting gear drives, in wind applications the frequency of premature failures seems to be higher (but might be also related to a larger population of installed machines). 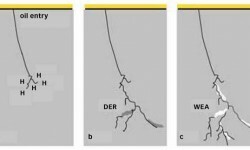 Commonly, early cracks have occurred within the first one to three years of oper­ational time or at 5 to 10 % of the calculated rating life (fig. 3). Mostly occurring on the inner ring, as shown in fig. 4, the visual appearance of early cracks varies from straight cracks (“axial cracks”) to cracks in combination with small spalls and large/heavy spalling. 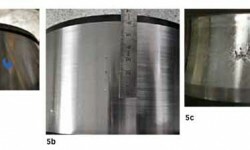 Based on SKF’s knowledge from increased field experience, it is concluded that early failures by cracks are neither linked to a particular type of bearing (fig. 5) nor to a particular standard heat treatment (fig. 6) 6, 7, 8, 9, 10. The failure appearance, however, is associated with the heat treatment (e.g., residual stress field), the stage of failure progress and very likely also to the operating conditions or bearing position (e.g., stress field from loading). As can be seen in fig. 6, for early cracking in this specific application, cracks in martensite rings tend to grow straight into the material (suggesting the straight “axial” crack appearance, e.g., fig. 6a), whereas in bainitic (fig. 6b) as well as in carburized case hardened rings, the cracks tend to grow circumferentially below the raceway (explaining the spalling/flaking type of appearance, e.g., fig. 6c). Nevertheless, in a very advanced failure stage, the inner ring raceways are often heavily spalled, independent of the heat treatment. Wind turbine gearboxes are subjected to a wide variety of operating conditions that may push the bearings beyond their limits (e.g., with respect to load, speed, lubrication and combinations of these). The wind energy segment faces some of the toughest challenges for extending bearing life and reducing the occurrence of premature failures while at the same time reducing the overall cost of energy. some design requirements can be conflicting, e.g., increasing rolling element size will increase the load carrying capacity but simultaneously increase the risk of cage and roller slip and sliding damage6, 7, 17, 23. As stated, bearings may fail for other reasons not attributed to falling below best practice standards24, 25 and from other industrial experiences. Statistical evaluations of a limited number of offshore wind turbines2 indicate clearly a correlation between failure rate, wind speed and heavy and fluctuating loads. The trend towards larger turbine sizes with higher power-to-weight ratios will invariably lead to more flexible supporting structures11 that, in turn, will influence the load sharing and load distribution within the rolling bearings as well as on other drive components. According to reference 26, in “young”, heavily loaded applications having a highly innovative product design life cycle, sufficient experiences are often lacking with respect to the machine’s endurance. Independent of wind turbine and gearbox manufacturers, the presence of cracks on bearings is sometimes interpreted as indicative of uncontrolled kinematic behaviour19, 27. The occurrence of premature failures is heavily discussed within the wind industry and independently investigated by wind turbine manufacturers, gearbox manufacturers and bearing suppliers as well as universities and independent institutions. Unfortunately, a consistent theory does not exist today. To list and explain all WEC failure root cause hypotheses would go beyond the scope of this paper. Nevertheless, many of the existing theories from literature can be briefly summarized as shown in fig. 7. 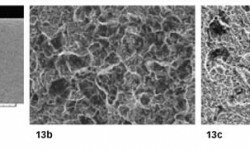 Many papers (for example, reference 10) discuss a local change in the bearing material microstructure into WEC by certain influen­cing factors. microstructure, heat treatment, natural hydrogen content, cleanliness (different type of inclusions), residual stresses, etc. overloads, peak loads, impact loads, torque reversals, vibration, slip, structural stresses, electric currents, etc. lubricant, additives, corrosion, tribochemical effects, hydrogen generation, temperature gradients, contamination (e.g., water), etc. mounting (e.g., scratches), transport, quality aspects, etc. To increase the complexity, most influencing factors are also correlated. Thus, driven by a single factor or by a combination of several factors, WEAs develop locally in the bearing steel matrix. The WEAs will then be the nucleation sites of cracks that finally propagate to the bearing raceway. As a consequence, the bearing will fail by spalling or so-called WSF. Most common hypotheses can be further divided into hydrogen enhanced WEC developments28, 29, 30, purely load/stress related WEC developments preferable at inclusions31, 32 or some combination of reasons33. alternator and generator bearings (e.g., damaging current – corrective action by use of special greases and/or hybrid bearings, special steels)6, 35, 36. Nevertheless, in general, the relevance of the common WEC hypotheses to premature wind gearbox failures is not sufficiently clear yet. According to SKF experience, most early bearing failures are related to lubrication or other surface-related issues and can partly be estimated by the SKF advanced bearing-life model. SKF internal investigations have revealed that many cracking failure modes in wind gearbox bearing positions most likely have their origin at or near the surface (0–150 µm) and propagate into the material under the influence of a corrosion fatigue process6, 7, 16. Wind gearbox bearings are relatively large, and for larger bearings the crack initiation and propagation mechanism can differ compared to small bearings6, 16. For instance, a deeper radial cracking is reported in larger bearings at moderate loads due to the residual stresses and higher hoop stress37. In case of premature wind gearbox bearing failures, the failure occurrence suggests fast crack propagation. The fast branching and spreading crack propagation can be explained by the presence of chemical influencing factors such as oxygen and ageing products of the lubricant at the crack faces/tips6, 16, 38. In a completely sub-surface crack system, we have vacuum conditions and consequently significantly slower crack growth from pure mechanical fatigue38. In other words, already at an early stage, the cracks or crack systems must be connected to the surface to allow the entrance of oxygen and lubricant. Hydrogen-assisted fatigue can lead to similar effects28, 33, or to accelerated classic rolling contact fatigue6, 35, 36; however, this would require, for example, aggressive corrosive environment or continuous high-frequency electric current passage. The presence of free water leads, likewise, to a highly corrosive environment34, but elevated water contents in the lubricants are claimed to be under control by the turbine manufac­turers. Moisture corrosion in wind gearboxes is usually not seen during SKF investigations. If that can be excluded, then regenerative passivating tribolayers usually provide a barrier to corrosion and hydrogen absorption into the steel, if continuous and intact. All told, if hydrogen absorption occurs in the steel, it is detrimental; however, the available evidence of this failure mechanism in wind gearboxes is relatively weak. Nevertheless, SKF tribochemistry studies confirm the local generation of hydrogen in severe mixed friction contacts. To continuously generate hydrogen, fresh, interacting metallic surfaces are needed. This could lead to a local weakening effect on the surface, facilitating a surface crack generation. However, in wind gearboxes, severe wear is hardly seen on the failed bearing raceways, which would allow hydrogen permeation. Thus, hydrogen permeation through the bearing raceway (without any additional factor) seems not to be likely. A potential additional factor could be the relative aggressive wind oils, eventually in combin­ation with contaminants39, 40, 41. In SKF’s experience, the performance of wind gearbox oils can be distinguished from surface initiated failure mechanisms39 (e.g., surface distress). To quantify the relevance, further investigations are needed. 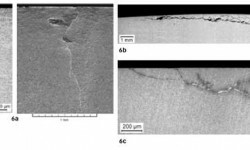 At the moment, the role of hydrogen generation is seen as a local effect generated in the crack systems due to lubricant entry leading to the mecanism of corrosion fatigue cracking (CFC)6, 16. The normally moderate bearing load conditions in wind gearboxes, the absence of compressive residual stress build-ups (in the area of the maximum von Mises equivalent stress) as well as the decrease in the X-ray diffraction line broadening close to the raceways in failed bearings (e.g., due to mixed friction – shear stresses and vibrations) shown by ma­terial response analyses further support a surface or near-surface failure initiation6, 7, 16. Lately, it is known that not only inadequate lubrication conditions, but also certain vibration effects at higher frequencies, are able to reduce the film thickness and consequently increase the risk for conditions of local mixed friction42, 43. According to reference 44, the generation of WEC networks is less influenced by Hertzian pressures, and most influencing factors are surface based. The often-disputed role of butterfly crack generation at inclusions, which show a similar altered microstructure as seen in WEC, is considered as part of the classic fatigue mechanism that is well covered in the bearing-life model7, 44, 45. Little experimental evidence is reported that supports butterfly cracks propagating into WEC networks10. A high butterfly density is a sign of overstress or very heavy loading (> 3 GPa), but excessive loads are claimed not to exist by the turbine manufacturers. This seems to be supported by standard gearbox HALT tests. A highly accelerated life test (HALT) is a stress testing methodology for accelerating product reliability during the engineering development process. There, the metallurgical investigations often show an elevated number of butterfly formations in the bearings due to heavy-load test conditions, but failed bearings from the field often do not show a significant increase in butterfly formations6, 7. Especially at the high-speed stages, the loads are usually moderate, but bearings can still fail by cracks / WEC without showing a significant population or even individual exemplars of butterflies6, 7. It seems that standard gearbox HALT tests do need further adaptations to reflect the early failure mechanisms as seen in the field. 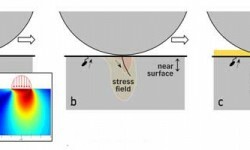 Nevertheless, the occurrence of unexpected high sub-surface stress-induced bearing damage32 also by inclusions cannot be fully excluded as long as the exact contribution of transient running conditions is not fully understood. The exact loading of wind gearbox bearings in the field is very much based on wind field simulations, later on further reduced to quasi-static load assumptions; and moderate bearing loads are assumed at nominal conditions. Non-steady-state conditions should be kept in mind and are increasingly taken into account by the wind industry. There is a general agreement that it is not nominal wind gearbox operating conditions but rather transient, partly unknown, conditions that lead occasionally to disturbed bearing kinematics, loading and lubrication. Basically, it is assumed that high surface stress concentrations can be reached, e.g., by vibration-induced local mixed friction6, 16, 47, misalignment or other events as already mentioned. At boundary lubricated patches at asperity level, the stress concentration of the tensile stresses can increase and open a crack under repeated cycles (areas of high stresses just below the roughness)48, 49. As schematically shown in fig. 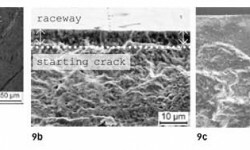 8, transient conditions can trigger surface cracks, possibly accelerated by tribochemical effects6, 16, 39, 40, 41, or sub-surface cracks that reach the raceway when starting at weak points such as inclusions close to the surface (< 150 µm)6. The inclusions can be soft MnS or hard oxides that naturally exist in any bearing steel. In addition, small MnS lines at the raceway can sometimes be dissolved by the lubricant and act also as potential surface cracks6, 16 and/or environmental corrosive cracks. Examples of a shallow surface crack are shown in figs. 9 and 10, and often it requires significant effort and experience to find them at an early stage6, 7, 16. The cracks shown in figs. 10 and 11 are generated in an automotive rolling-sliding contact at high traction and contact pressures, similar to potential wind load situations of around 3 GPa18. Once the bearing raceway is locally damaged, the highly EP doped lubricant will penetrate into the crack. Depending on the crack orientation, hydraulic effects will additionally push the crack propagation46. As indicated in fig. 12, the lubricant (often aged and/or contaminated with water) will react inside the material at the fresh metallic crack flanks. In other words, a corrosion fatigue crack propagation process, CFC, is triggered. This leads to a hydrogen induced microstructure transformation by means of hydrogen release from decomposition products of the penetrating oil (additives, contamin­ants) on the rubbing blank metal crack faces that in turn further accelerate the crack propagation6, 7, 16. This conclusion is also supported by spatially resolved determin­ations of the hydrogen content in damaged bearing rings, which confirm that hydrogen absorption occurs late in the damage process7, 16. As shown in fig. 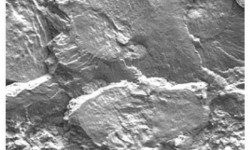 13, a fractographic investigation in the preparative opened forced fracture face close to the inner ring crack reveals an intercrystalline microstructure that indicates mater­ial embrittlement by hydrogen, released from the ageing lubricant products6, 7, 16, 41, whereas distant from the CFC crack, a normal largely transcrystalline fracture face is seen. Further indication of such a CFC mechanism is found by EDX analysis of lubricant and additive residuals within the opened crack system6, 7, 16. Inside the crack system, the mechanism of CFC will then transform the microstructure locally into white etching areas and lead to the typical appearance of an irregular WEC network (e.g., figs. 2, 6, 14). Thus, WEC are considered as secondary; a by-product of the CFC mechanism, as the hydrogen released and energy dissipated at the crack flanks result in a local change of the microstructure then appearing as a white etching crack decoration. The distribution and intensity of the WEC decoration effect is relatively complex. It depends very much on the distribution of lubricant residuals inside the crack network, the local rubbing effect in the crack faces and the local equivalent stress fields. Finally, fast three-dimensional crack propagation/branching in combination with crack returns will lead to a fast failure of the concerned rolling bearing surfaces. The fast growth of the wind industry as well as the trend to increasing turbine sizes erected at locations with turbulent wind conditions puts significant challenges on the rolling bearings in the drive train. One consequence of this evolution of a relatively young industry has been premature gearbox bearing failures. Over the years, the discussion in the industry was mainly focused on the influence of bearing material and heat treatments. Recently, there is a general agreement that specific wind conditions can lead to disturbed bearing kinematics, loading and lubrication. In other words, the root cause failure will not be found inside the bearing only. 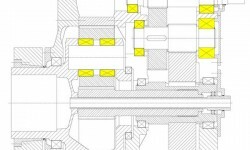 The complete application interfaces between the bearing and the gearbox / turbine need to be considered. 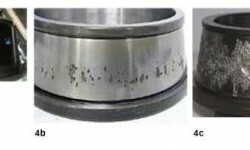 The phenomenon of wind gearbox bearing failures by cracks / WEC has been described. A failure hypothesis has been introduced. SKF investigations reveal that cracking failure modes in critical wind gearbox bearing positions most likely have their origin at the surface or near surface and propagate further into the material under the influence of a corrosion fatigue process. Due to the high complexity of a wind turbine as well as the very different bearing locations that can be affected, it is very unlikely that there is only one application condition root cause. However, it can be stated that any condition that leads to disturbed bearing kinematics, such as high vibration levels and high sliding friction, should be avoided in order to reduce micro-wear and high tensile stresses. To effectively support the wind industry, SKF as a bearing manufacturer is focusing on bearing modifications that aim to reduce the risk of premature bearing failures and increase bearing robustness under the specific conditions of wind gearbox applications. The solution strategy takes into account mainly the hypothesis introduced, but also addresses the common theories on WEC. 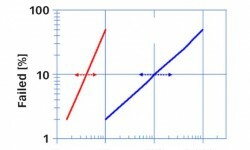 to increase the resistance against surface crack initiation and sub-surface crack propagation. In summary, a bearing modified as described above can reduce premature failures but needs to be combined with further improvements of the total design in light of the actual application conditions. Therefore, collaboration between all partners in the design process is needed and advanced calculation tools should be used to analyze the operating conditions to identify critical operating conditions and to eliminate the potential damaging ones. A stronger focus on component testing combined with real-size dynamic tests (e.g., in research institutes such as NREL, NAREC, Fraunhofer, etc.) should enable reproduction of damaging operating conditions and the testing of potential solutions.